Reports from Cameroon say the U.S. has placed sanctions on President Paul Biya's regime. These sanctions affect over 20 military personnel, civilians, and ministers. They have been banned from entering the U.S, according to Cameroon Info.net. The names of those affected were not released, but is said to include top civil administrators and ministers. Washington is accusing Yaounde of committing attrocities in the ongoing Anglophone crisis, and also for the arrest and detention of opposition leader Maurice Kamto. 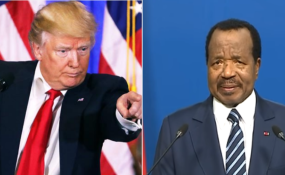 According to the reports, relations between Cameroon and the Donald Trump administration have not improved despite the visit of Assistant Secretary for African Affairs Tibor Nagy Jnr. In addition, many other aid and security programes promised by Washington have been withdrawn, including an offer to provide training to the Cameroonian military. The total aid package from the White House to the Unity Palace amounts to U.S.$17 million annually. The high representative of the European Union for Foreign Affairs and Security Policy Federica Mogherinihad also voiced concern about abuses by the military in the restive English-speaking regions of the country and the detention of opposition leader Kamto.